The local comic jams group, a club that spontaneously composes comics in a sort of informal assembly line (they practice their art the same way that bands jam together) is drawn together by their affinity for their timeless craft. Literally. Together, they scribbled, drank coffee or beer, and hung out at Spyhouse Espresso Bar, 2451 Nicollet Ave., and Downtown at Grumpy's Bar and Grill, 1111 Washington Ave. S., at two monthly meetings. The Cartoonist Conspiracy is an informal group wherein novices sit alongside professionals. Core members mingle with a constant stream of newcomers. There are no membership fees or prerequisites for joining. Attendance is casual, and conspirators came armed just with paper and pencil or pen. The all-ages group could be spotted easily. They weren't dressed alike in a scream of subculture, but they were seated at several tables squeezed together with their heads bowed diligently over in-progress sketches. Altogether, they challenged a traditionally desolate art -since making comics is a slow and personal process. They've taken that isolating love of ink and graphite and turned it into sociable collaboration. Cartoonists illustrated quirky comics, including ones about the discovery of a comic on the bus, so-called modern voodoo and what they entitled the "Beatnik Brigade" at a recent Cartoonist Conspiracy meeting. The group previously rendered humorous accounts of other absurd themes, such as the Cheshire Cat, Paul Bunyan and mass media. Sometimes their end product was a lengthy comic strip with panels that had been touched by everyone's pens. Other times, they put together much briefer free-for-all comics. The productive group's collective stories weren't premeditated and were accomplished entirely during the meeting. Meanwhile, curious onlookers peered over the makeshift formation of tables. The spectators' eyes widened at the sight of so many sheets of comics, many of which were skillfully rendered. The cartoonists handled each other's funny pages reverently. They chuckled at absurdly drawn antics, did some trouble-shooting, discussed things like "MAD" magazine's changes in their lifetime and the latest buzz - a Japanese brush pen that had quickly become a hot item but could only be acquired overseas (like ordering drugs on the Internet). Cartoonist Conspiracy mastermind-founder Steve Stwalley described the group's meetings as antisocial social events. Stwalley, a Web designer at Downtown's Olson and Company, 1625 Hennepin Ave., started the group about two and a half years ago as a creative outlet - a means to draw regularly and team up with other cartoonists and to promote comics. A handful of cartoonists showed up for the very first Conspiracy meeting in November of 2002 at a South Minneapolis espresso bar after Stwalley tacked up posters and fliers around town. Since its inception, anywhere from seven to 30 artists of all ages now routinely attend meetings. The Conspiracy continues to gain momentum, though some bemoan the gender gap - that is, few women attend. Recently, the group added a second monthly meeting at Grumpy's, and they participate in annual events such as the 24-Hour Comic Draw that'll take place on Saturday, April 23 at Big Brain Comics, 1027 Washington Ave. S.
At the event, cartoonists pledge themselves to a 24-hour sketching marathon wherein they individually create a 24-page comic. Last year, the crew transformed the side room into an art studio. After their drawing session that didn't end until the wee hours of the morning, they trekked to Kinko's and bound and reproduced their night's endeavors. Stwalley called it "extreme sports for cartoonists." Each artist raced against himself or herself in an attempt to produce more comic pages in one day than they ever had before, some of the artists said. Many of the cartoonists attributed the group's growth to Stwalley's dedication and industry. But the Cartoonist Conspiracy isn't the only project that Stwalley has going. His ventures include a children's book, a publishing company called "Rubber Chicken Funnies," a compilation called "Weird Illustrated" and an anthology of Sunday funny sections. Russian comic artist Andrey Feldshteyn, who migrated to the U.S. about 11 years ago and is a computer programmer at Downtown's Government Center has cartooned for 35 years and his gag strip "Cartoon Blues" is known internationally. Some of his cartoons are housed in the Cartoon Art Museum in San Francisco. He started attending Cartoonist Conspiracy meetings last year, after reading the Skyway News story ("The 24 hours of cartoons") last May about the all-day drawing session. In Russia, Feldshteyn was known as the "tender cartoonist." His cartoons resembled old New York comics, with brushed outlines and shadowy light washes. Usually he does large-format cartoons that run half the size of a Grumpy's table. Staple conspirator Dan "Danno" Oschendorf, a Downtown Kinko's employee taped Feldshteyn's pieces on his wall before they ever met through the Cartoonist Conspiracy. Oschendorf, an original member of the conspiracy who produces a comic called "Staplegenius," also recalled looking up to comic artist Zander Cannon when he was young. After he read Cannon's "Chainsaw Vigilante" he asked the artist for his autograph. Cannon encouraged Danno to keep drawing. Years after Danno's inspiring encounter with Cannon and brush with Feldshteyn's work, the motley crew sat at the same table and labored over their cartoons; Feldshteyn, Cannon and Danno sat at the same table. Said Cannon, "It really feels like there's a community. You always know about stuff that's happening with cartoonists. That's the most important thing." Recently 32-year-old Cannon drew top comic artist Alan Moore's story "Smax." It took him two years to draft. Now he's working on a sequel. The accomplished artist has composed comics since a class he took at 7 years old, where he learned to make preliminary pencil sketches that made lines fluid like animation. Later, he made complex flipbooks. But the former English major admitted that he still has trouble capturing hands. "Sometimes it's hard to take pride in your work," he said. "It's hard to shift from just getting something done to getting this line just right." In contrast to his colleagues who scribble primarily for entertainment value, conspirator and Downtowner Adam Wirtzfield's day job is to illustrate educational graphics for attorneys who hand them to jurors as visual aids during trials. He said that comic illustrations could be a great teaching tool because they simplified concepts that people could grasp quickly once they were explained visually. For example, Wirtzfield's latest project is a visual aid for a jury, called a "pressurized vessel construction." Sadly, for all those curious about what a "pressurized vessel construction" might be, he couldn't divulge more information about just what it is because the judicial process was still in progress. Wirtzfield got into cartooning in the first place because he admired comic strips such as "Calvin and Hobbes" for their artistry rather than for the jokes and punch lines. His comic education began with free comics he acquired as Halloween treats from a neighbor who passed out comics like candy. After majoring in philosophy and German literature in college, he attended cartooning school at the New Jersey-based Joe Kubert School of Sequential and Graphic Art, one of the few cartoon schools in the country. Nick Post, who co-owns the suburban Source Comics and Games, works closely with the Minnesota Comic Book Association and has collected comics since the 1960s, admires the Conspiracy's drive. Their studious efforts motivated him to pick up a pen and paper and doodle himself, even though he doesn't consider himself an artist. Not only were they talented draftsmen, he said, but also able writers. Most of all, their passion and industry compels them to get stuff done. At the end of a jam, for instance, everyone has usually produced a readable, well-crafted comic strip. Further, they've collaborated in a way that's true to the spirit of comics themselves. That is, it's more about self-development and satisfaction than making a profit. Post said he felt welcomed by the Cartoonist Conspiracy even after he conceded that he didn't know how to draw. "There's so much energy and passion in that group," he said. "The storytelling and the variety of topics that they tackle are just amazing. To watch them work makes me want to pick up a pen and piece of paper. They just have to get something out. That's how they feel, like they're nine and a half months pregnant all the time." Likewise, comic book readers too are now more focused on story and presentation, he said. Said Post, "It's all about the artist's vision. People want to read about personal stories, coming-of-age, romance, monsters, every genre. As long as I've been in comics, they've never been so diverse and never better." Calling Minnesota a hotbed for comics, he cited area illustrators who'd gone on to draw Batman, Captain Marvel and other sought-after work. Furthermore, thousands attend local comic conventions, and the Minneapolis College of Art and Design, 2501 Stevens Ave. S., offers a cartooning degree. But it's still a struggle for a cartoonist to get access to an audience, Post noted. How do you make yourself known in a stratified market? Post said he wished that more media would feature their talented local cartoonists. Conspirators such as Ken Avidor, Roger Lootine and Andy Singer - all of whom currently show at the exhibit about biking life, "Bikes, Comics and Beer" hanging at One On One Bicycle Shop, 117 Washington Ave. N., were cut from steady cartooning positions. Local publication "The Pulse" let go of Lootine as well as Avidor, who said he guesses that his images are too strong for local media. He mentions one image in which he depicts a broken track and two bike riders about to tumble into the ruins of the Mall of America. Additionally, Singer's single-panel strip ran in the Pioneer Press until last year when the paper picked up a cheaper, syndicated cartoon. Although Singer tries to secure gigs in other publications, it's hard to get people to call him back, he said. "Cartooning is tough. These papers are dying, in part to competition and the proliferation of other venues for receiving news," Singer said. Because chains bought out a lot of publications, they've downsized with syndicates. Diminishing staff can't support independent artists, and paid markets are shrinking, he said. Some voiced additional concerns, too, like the issue of censorship. Shad Petosky is a Conspirator and graphic designer for Big Time Attic, where he works with Conspirators Zander Cannon and Kevin Cannon (the Cannons are unrelated). 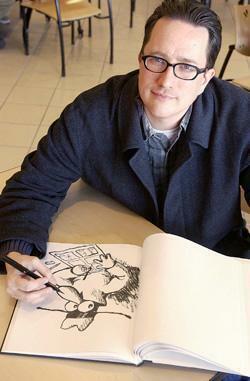 Said Petosky, "The notion that comics are for kids gives people a good reason to scrutinize content. Paintings can hide in galleries, but comics are made to be sold and distributed. If you do it the wrong way in the wrong state, you can get hit with all sorts of vague obscenity law." However, Petosky said that one edge the comic industry has over the book publishing business is that it doesn't sneer at vanity press. Vanity publications are paid for by authors, who retain all ownership rights. Petosky said that almost anyone could vanity-produce and reproduce their own comics and then distribute their work, without going through a larger publisher. Such works could sell next to expensive, more traditionally published products. At any given comic store, a $1 photocopied book sits alongside a full-color hardback that's $50. Petosky said he believes that in this fast-paced world, people still stop to read comics. "When it's late at night and I'm pulling a brush along a piece of paper that's lit by one bulb, there is no sense of what decade I'm in," he said. Check out the Cartoonist Conspiracy at www.cartoonistconspiracy.com. Their meetings occur the first Thursday of every month, 6-9 p.m. at the Spyhouse Espresso Bar and the month's third Sunday, noon-3 p.m. at Grumpy's Bar and Grill.